For example, it’s often said that the best light for photographing wildflowers is under overcast skies (I’ve even said it myself here on PN!). 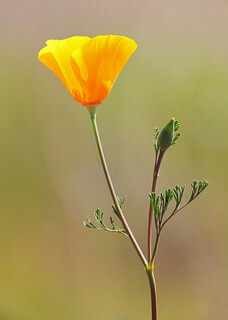 And, for a long time, I would only photograph wildflowers under overcast skies (or with some kind of light diffuser). But, then I started seeing all these great images of wildflowers under bright sunlight. I really liked how the bright sunlight helped “light up” the inside of the flower, so I started looking at wildflowers differently ever since then, and now I have numerous photos of wildflowers under bright sunlight (like the one above). Another common rule of nature photography is that “good light” for landscapes only occurs around sunrise or sunset (because the light is extremely warm at that time). But, did you know that Ansel Adams shot many of his landscapes in the middle of the day? The bright midday sun may not always produce the kind of light you’re looking for, but it’s great for capturing harsh shadows between mountain ridges. So, don’t get caught in the trap of thinking that a certain type of light is always bad for a particular subject. Instead, observe how different types of light affect the appearance of things, and use that to your advantage. Although I often prefer diffuse light for flower photography, I always enjoy shooting flowers backlit on sunny days, especially California Poppies like you have in your example. One of our greatest blessings is also one of our greatest curses. We read photo mags and blogs to get all the best advice about learning the photography craft. The information is great, to a point; because it is too easy to make the assumption that there are right ways and wrong ways to take any type of picture. Authors are entitled to their opinions and we need to be receptive to the great advice that is given but we all must make sure that our creativity is not lost in the “rules”. Bravo! There is no such thing as “bad” light. I am so tired of the premise that landscape shots should only be taken at sunrise or sunset! They’ve become static and boring, never seeing things in the light of day. I love seeing blue skies and clouds in photos (or dark clouds, etc.) – that’s the way nature is most of the time. Why can’t we just show nature as she is? I love photographing at the “magic hour.” You can capture scenes then like you can’t at any other time. Having said that, I found out that you can probably take great pictures at any time of the day, under any conditions with some imagination, understanding, and patience. I live in the Tucson area. Right after church one Sunday afternoon, I noticed a Saguaro Cactus in an entirely different light compared to the magic hour. There were details in the textures shown that I’d missed before. Fortunately I caught it when the sky was a dramatic blue, which was also an improvement. Now I prefer to keep the camera with me all the time, with my eyes open for some suprise I might not have thought of before. Those of us who don’t get to make our living with photography have to take the light as it comes when we find the time to get out there. I personally look at that as opportunities to figure out how to use whatever light may or may not be available to me. My favorite subjects are wildlife & nature and yes, I like to take get out there either during the early or final daylight hours of the day to catch that soft light. I’ve also had some of my photography friends tell me that they don’t like that brilliant blue sky in their shots because it’s boring and ominous dark clouds make for more interesting pictures. All of those statements are true, just not all of the time. There is a time and a subject for all sorts of conditions. So guess what, one of my favorite shots was taken mid-day during a work week on a Fall day with brilliant blue sky, not a cloud in sight. My subject? A very tall, bright red crane near a historical building. That day I took a picture of something I normally would not, during a time I’m usually working and according to the rules regarding light I should not have even had my camera with me. Really nice to hear that admission Steve! I am relatively new to photography, though I have been working in commercial printing for almost 30 years. I learned about photography on a 16 foot line camera and tray developing line shots and halftones. While reading hundreds of blog posts and the advice of others I have always in the back of my mind kept the thought that I simply love the way stronger shadows and brighter colors from more intense sun contrast each other. There’s no doubt that each different type of lighting offers our own little ‘screen captures’ of what beauty we behold at that moment in time. After all, that is why we take photos, isn’t it? To grab that moment of light and time that struck a chord in our heart strings. Sometimes that moment is an a dazzling blast of mid-day sun emblazoning colors that lift our spirits and as we grow in our experience as photographers we learn to ’embed’ those colors a little more accurately with each new shutter actuation!